1892 The first intercollegiate debate in the US occurred in the United States between Yale and Harvard in 1892. (See Nichols 1936). 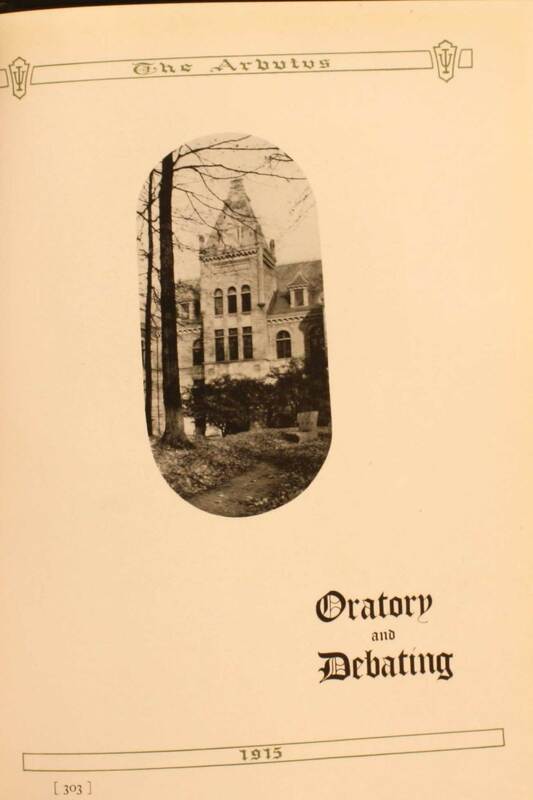 1896 IU continues intercollegiate debates with Depauw University. 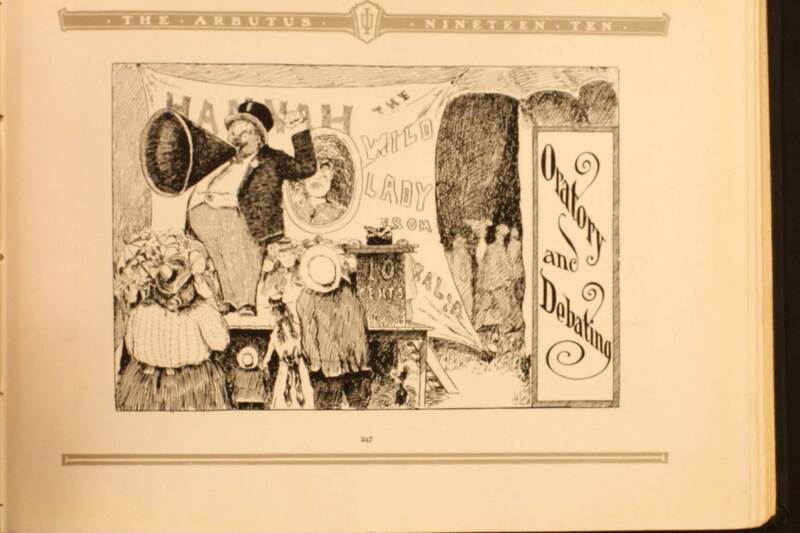 1897 and 1898 IU debated Butler. (1904d). 1897 Indiana debates the University of Indianapolis over compulsory arbitration on interstate railroads. 1898 Becomes member of Central Oratorical League. Includes: Cornell, West Virginia Univ, Ohio State Univ, Ohio Wesleyan University, University of Illinois. 1901 Willis ‘O Taylor represents IU as the first documented African American champion of the State Intercollegiate Oratory Contest. 1902 Debates Illinois on whether Cuba should be annexed (1902c). A $50.00 campus oratory competition is established. Five speakers are nominated by faculty. Law school students establish the Reinhard club. The club’s purpose is “debating and extemporaneous speaking.” Limited to 15 students. 1910 Triangle debates: Resolved, That a Progressive Income Tax Would Be a Desirable Addition to the Federal System of Taxation. 1912 IU joins a 2nd triangle league with Wabash College and Notre Dame. IU also debated Depauw University. 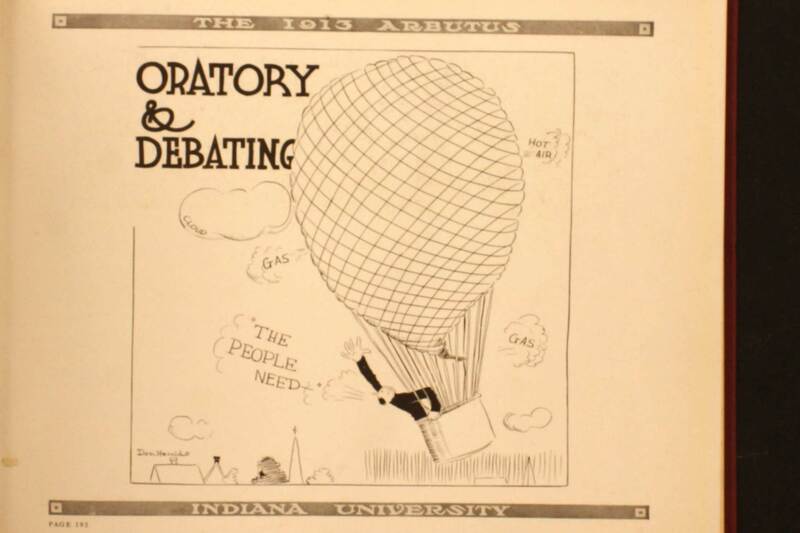 1913 Ohio/Illinois debate continue along with debates against Depauw, Wabash and Notre Dame. Coached by Ralph Sollitt. 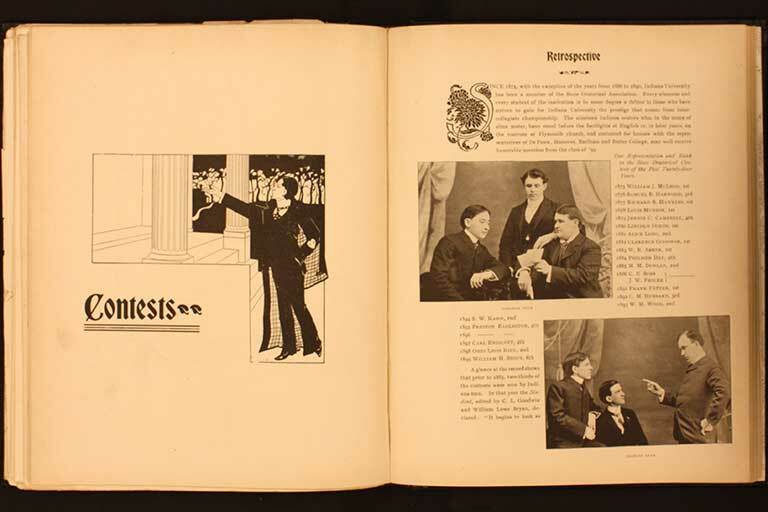 1914 Women are included in the first “Girls’ Discussion” competition. Triangle debate: Resolved: That a policy of fixing a minimum wage scale by state boards is desirable. The 2nd Triangle league includes Depauw and Earlham. 1915 Triangle debates with Ohio/Illinois continued (Arbutus called it “Old fashioned”). Depauw/Butler/IU “extension” debate competition includes the innovation of expanding the number of participating teams to 12! IU Joins Tau Kappa Alpha, the national honorary debating and oratorical society. TKA was founded by Butler. 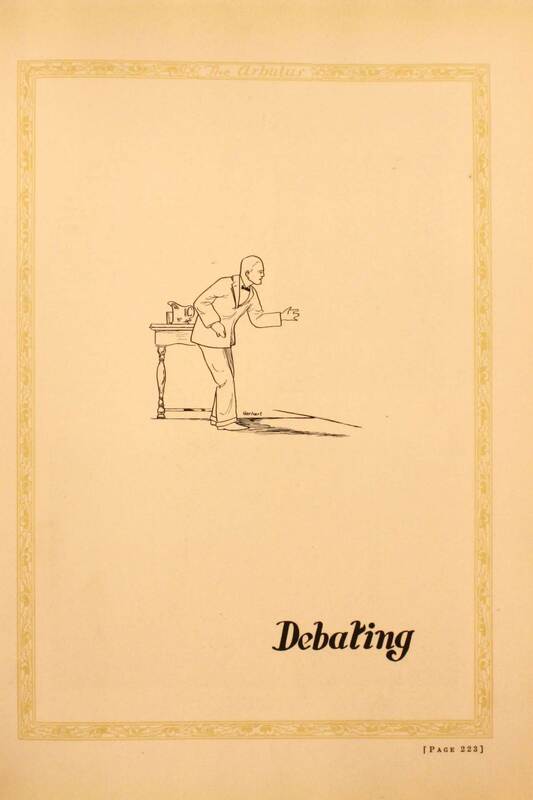 1916 Triangle debates end, titled “old method of debating.” Fourteen “Extension Division” debates are scheduled with Depauw and Butler in Fourteen cities in Indiana. Judged by public audiences. 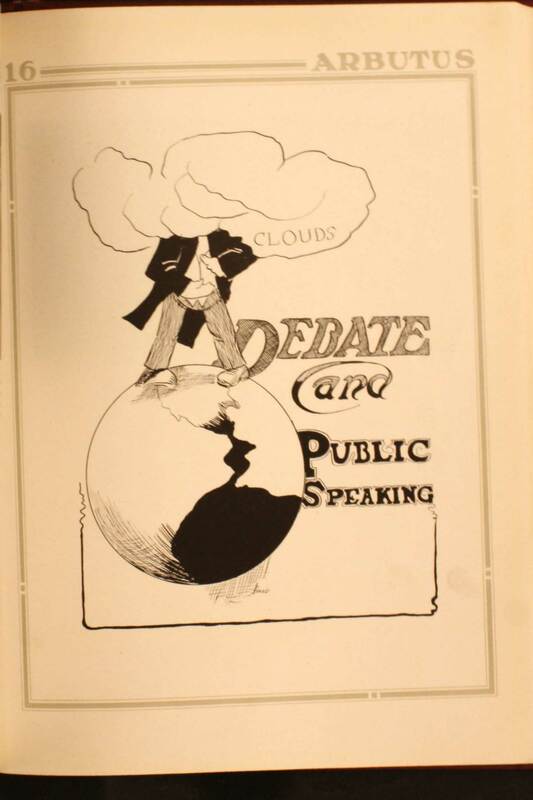 1917 The Indiana Debating League student organization is formed to increase enthusiasm for debate activities. Herman T. Briscoe was the founding president. He eventually became the IU Vice President and Dean of Faculties. Extension debates continue around the state vs. Depauw and Earlham. 1921 State triangle Debates had eleven teams entered. IU debated Purdue, Depauw, Ohio State and Notre Dame on the question of Resolved: That the Federal Government should own and operate all the coal mines in the United States, constitutionally granted and waiving the question of transportation.” Beaulah Radcliffe is the first documented female debate team member. 1923 Triangle debate returns with Ohio State and West Virginia university. Extension debates continued with IU debating, Depauw, Wabash, Notre Dame, and Huntington college. Professor H.M. Karr identified as coach. 1924 Coed debate society established. 50 students tried out, 16 team members selected. C. M. Niezer, debate alumnus, established the Niezer medals. Each member of the debate team receives a gold medal with their name and the debate that they participated in engraved on it. 1925 Indiana goes west! A team of three debated Univ. of Oklahoma, Colorado, Kansas, William Jewell, and Colorado State. Interest in debate is high but considered a struggle during the post-football era. Professor Karr departs as coach. Walter Helmke identified as assistant coach. Coed debate team debates Univ. of Cincinnati on Resolved that the Japanese Exclusion Act of the Johnson Immigration Bill Should Be Repealed. 1926 IU debates Cambridge in Bloomington. A crowd of 610 voted in affirmative for IU on the question of “Resolved, That This House Favors the Principles of Prohibition.” Coaches Lee R. Norvelle and Joseph Cohen identified. Coed team enters a Coed debating league known as Indiana-Michigan-Ohio League. 1928 IU join Phi Delta Gamma professional forensic society. Coed team debates Illinois and Michigan. International teams included Univ. of London, Univ. of Edinberg, and Univ of Reading, and the Philippines. Norvelle still head coach, Jasper Garland assistant coach. 1929 Start of the Big Ten Debating League. IU is “Co-champion.” Start of intramural competition with Neizer awards to the winners. Alphi Chi Omega and Delta Epsilon win intramural debates. 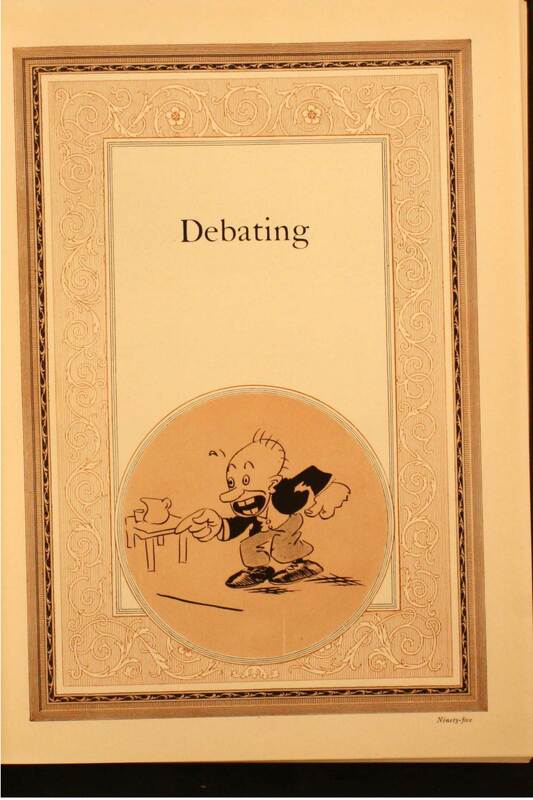 Intercollegiate debates occurred with Depauw, Miami, and Butler. No international debates held. Donald Bowen named as assistant coach. 1930 The team competes in 17 debates in the Big Ten Conference and non-conference members, Marquette, Louisville, Depauw, Florida, Miami, St. Louis, and Loyola. Lee R. Norvelle titled “Director of Dramatics.” Alpha Chi Omega and Delta Chi win Neizer trophies in intramural debates. 1931 Donald Bowen new debate coach. International debate returns against Cambridge University. Radio debates start against Univ. of Cincinnati, and Chicago Kent College over WGN. 1933 Coed debated Northwestern. Men placed 3rd in Big Ten League. Delta Zeta and Delta Epsilon were intramural champions. 1935 Seventy-Five students tried out for nine slots. Tau Kappa Alpha, Tau Kappa Alpha and Phi Delta Gamma hold a banquet. Awards were given to top journalist, speech, and debate students. 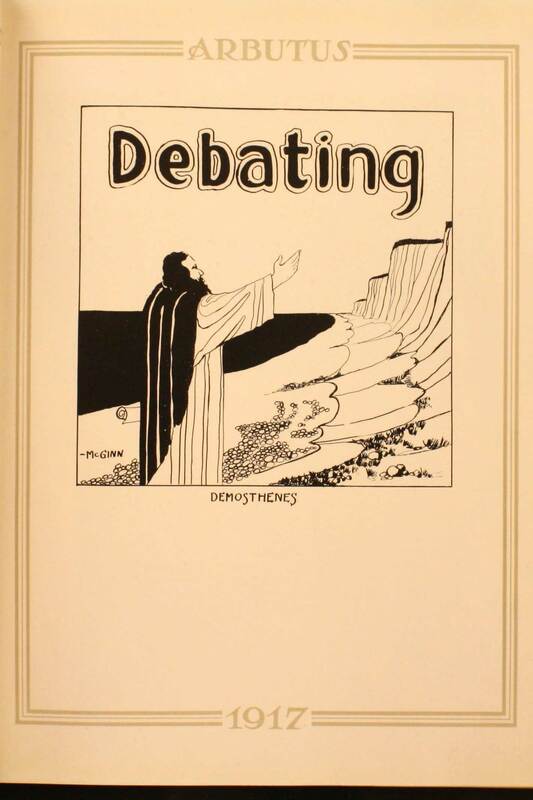 1936 New innovation to expand debate team size. Varsity men and women teams and freshmen men and women teams each participated in five intercollegiate debates. Male debaters took part in “Conference debates.” A fall conference and spring conference tournament was held. The fall resolution, Resolved: that the several states enact legislation provided for medical care available to all citizens at public expense. Spring resolution at the University of Chicago tourament, “Resolved: that congress should be empowered to over-ride, by two-thirds majority, Supreme Court decisions declaring federal laws unconstitutional.” Coed team debated Illinois and Michigan. 1939 Tied for 4th in Big Ten Conference debated Resolved, That the United States should form an alliance with Great Britain.” The mens team participated in 45 debates over the season. The women’s team joined an “independent” part of the Big Ten Conference. They debated Northwestern, Illinois, Purdie, and Ohio State. 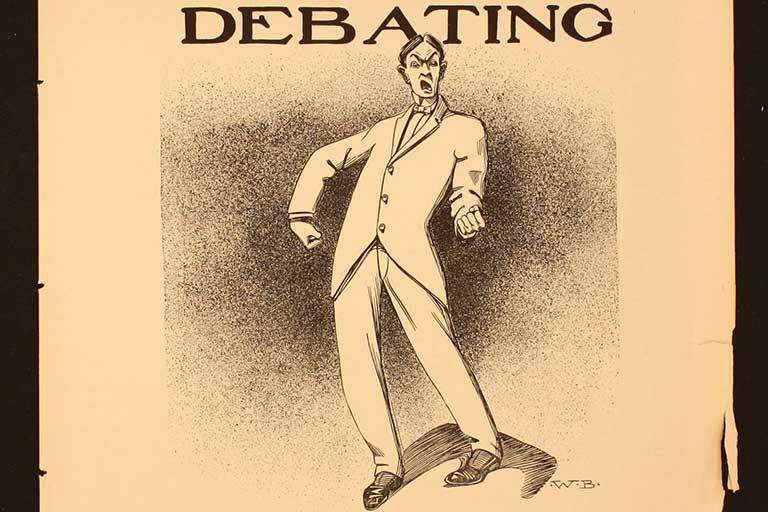 Types of debate included, radio, open forum, and conventional Oxford style. 1940 Team included twenty-nine members and more than one hundred debated during the season. The men’s team debated government ownership of railroads and US isolationism. The women’s team debated whether anti-democratic organizations should be suppressed as well as whether the Federal Housing Administration should be renewed. 1943 Competing despite the nation’s “transportation difficulties.” Debate Coach Dr. Larson named. 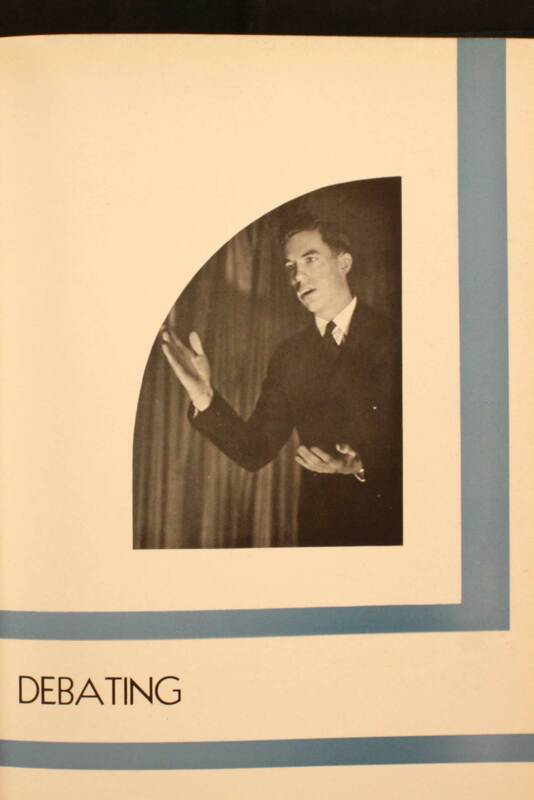 1946 Eugene C. Chenoweth became Director of Forensics or otherwise known as the debate coach. Will direct the team until 1960. Auspiciously started the annual Hoosier Debate Tournament (See 1961 note). 1948 IU Hosts the 8th annual National Tau Kappa Alpha Discussion conference. 1958 Debate and Delta Sigma Rho national forensics honorary. 1960 The team travelled to Wayne State, Bowling Green College, and State University of Iowa. Debated resolved: That Congress should be given the power to reverse Supreme Court decisions. Coached by Professor Robert Jeffrey. Consists of Intra-University and intercollegiate competitions. 1961 15th annual Hoosier Debate Tournament, included seventeen Midwestern schools and the University of Toronto. Debated the NDT topic. 1970 Bill Starosta of the Speech and Theater department named coach. 2009 Indiana Debate returns to campus with support from SPEA, COAS, Kelley School of Business and OVPUE. 2016 Indiana Debate qualifies two teams to the NDT.